James M. Kilvington, Dover, Del. WILMINGTON, DEL. 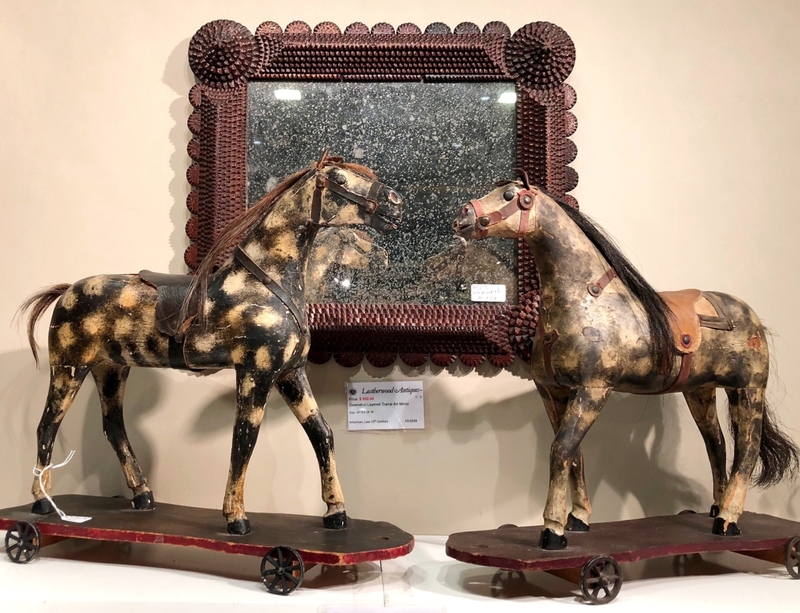 – The Delaware Antiques Show is making Americana great again. 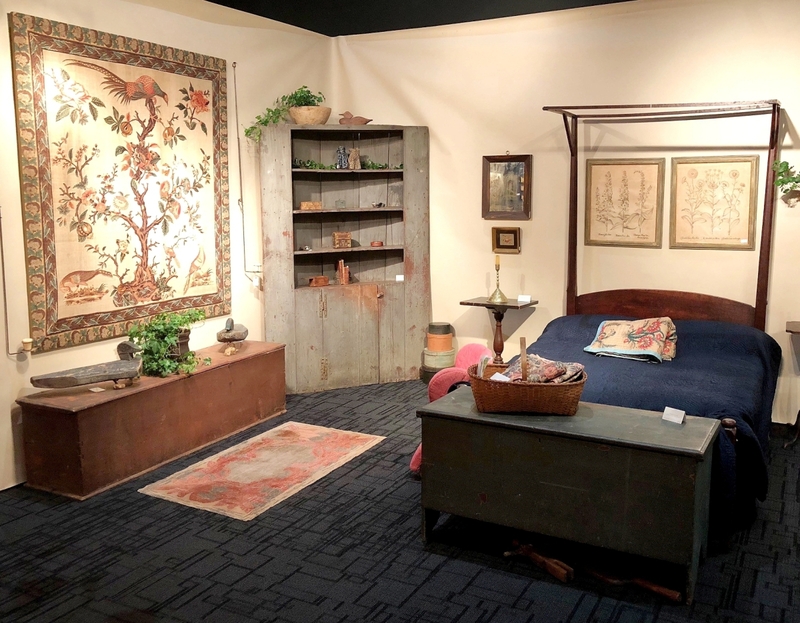 Many top-tier shows are trending toward border-busting, design-savvy eclecticism, convinced that cutting-edge variety is the best, or perhaps only, way to attract new, young, affluent buyers. 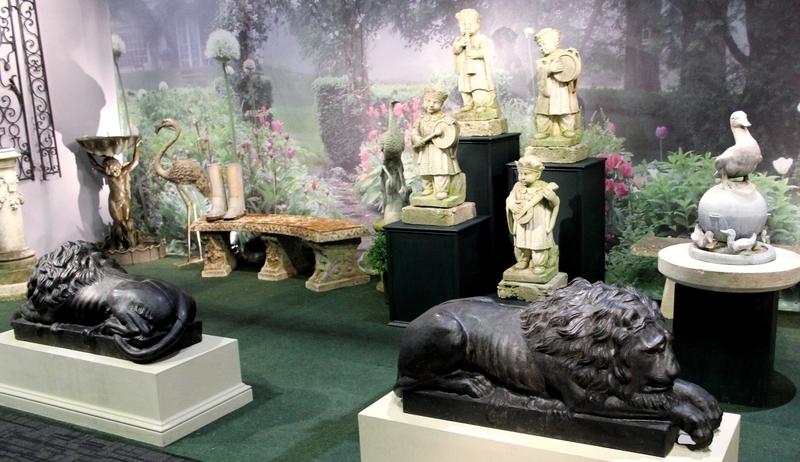 Contrarily, the Delaware Antiques Show embraces traditionalism, a distinct selling point in an otherwise crowded field. 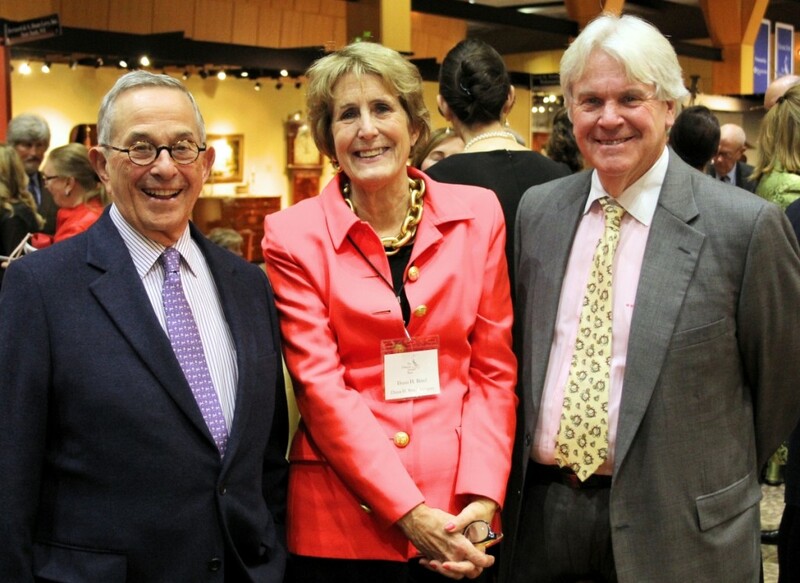 Stuart Feld, Diana Bittel and Bill Stahl. 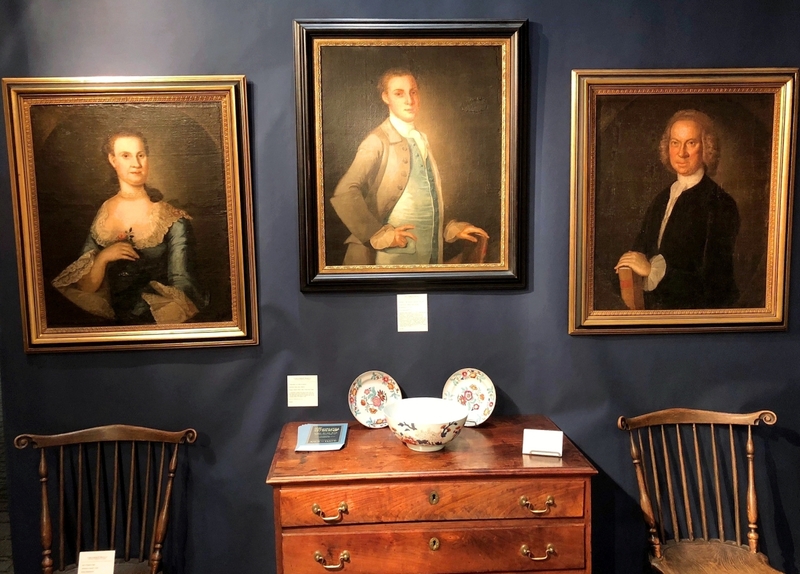 It helps that the Delaware Antiques Show, which opened at Chase Center on the Riverfront on November 9 and continued through the weekend, is organized by and for Winterthur Museum, Garden and Library, renowned for its collections of pre-1840 American decorative arts. 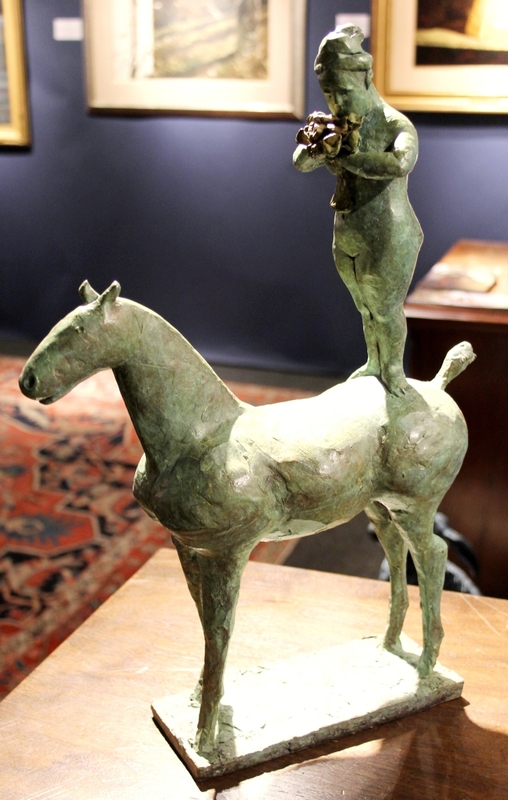 The fair also has going for it a pleasant, convenient venue; a first-rate committee and a fine manager, Diana Bittel; and steady support from Winterthur’s Henry Francis du Pont Collectors Circle, usually seen shopping here on opening night. “I think a lot of business was done. 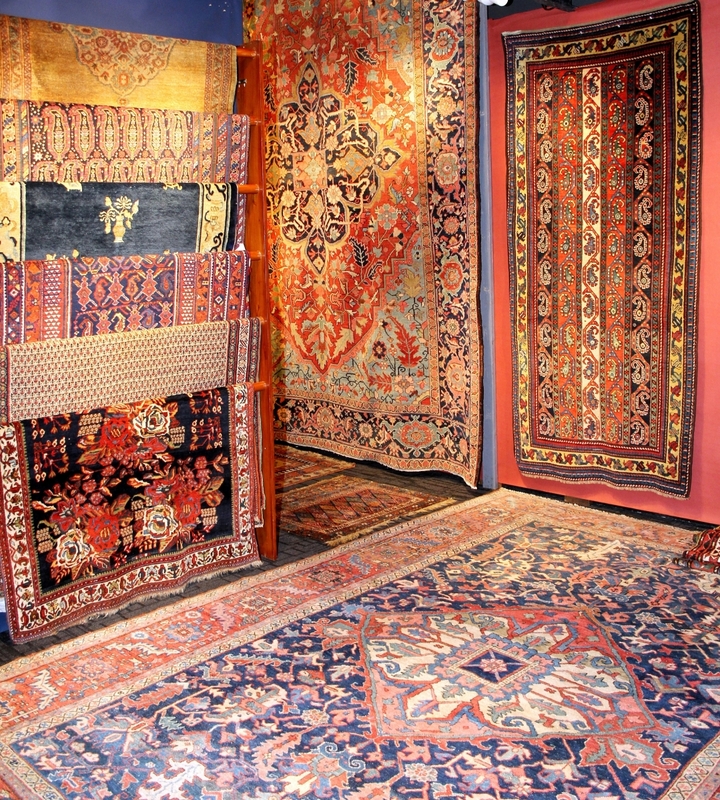 The dealers did a great job. The gate was up a little from last year, which was a banner year. 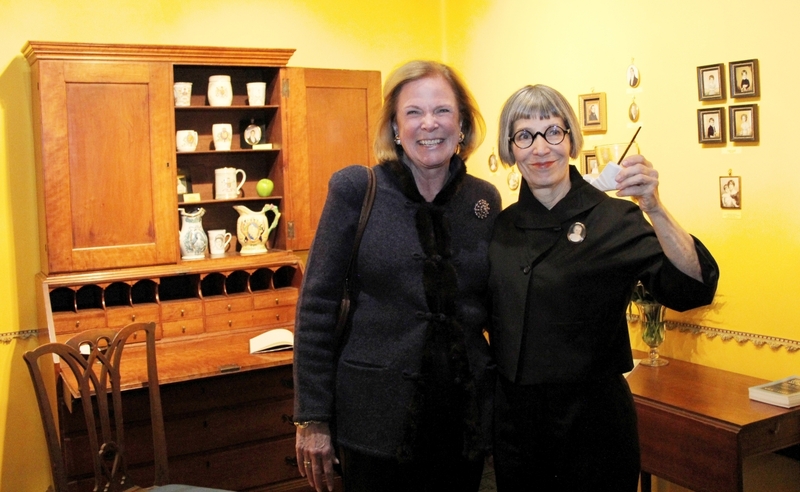 Winterthur was thrilled,” Bittel later told us. 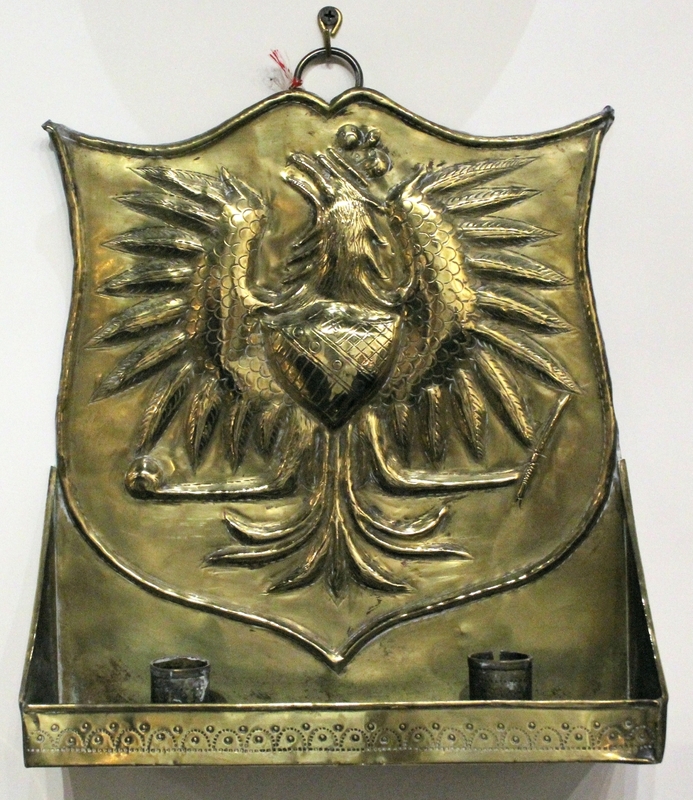 A colorful amalgam of regional interests and traditions contributes to the show’s distinctive personality. Winterthur’s influence is pronounced. 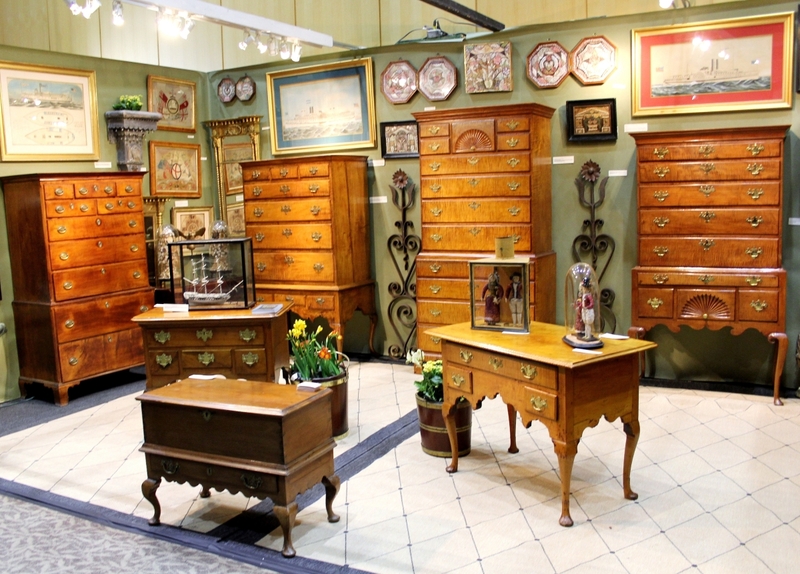 The Delaware Antiques Show is one of the great venues for Eighteenth and early Nineteenth Century American furniture, much of it formal and made along the Eastern Seaboard. Pennsylvania pieces were plentiful. 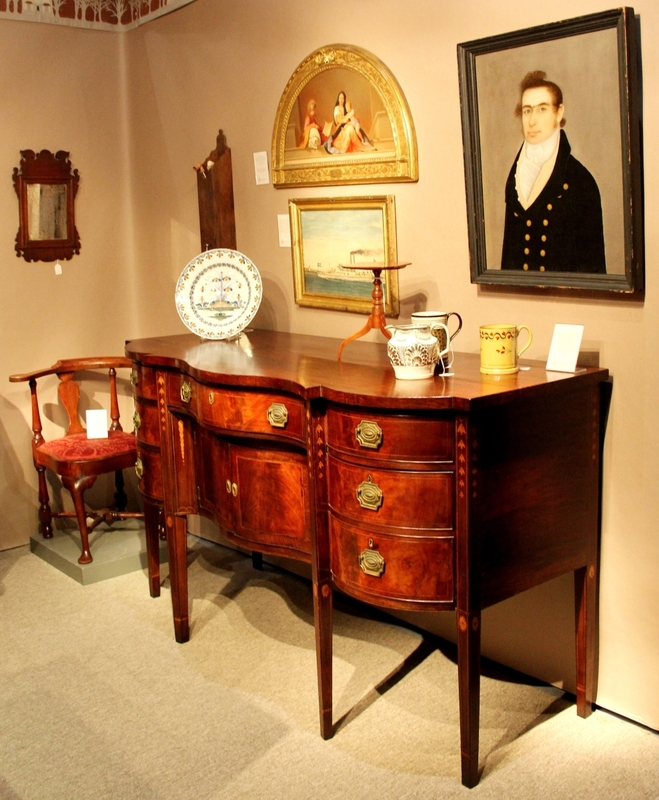 Kindig Antiques featured a Philadelphia Chippendale high chest of drawers of about 1760. H.L. 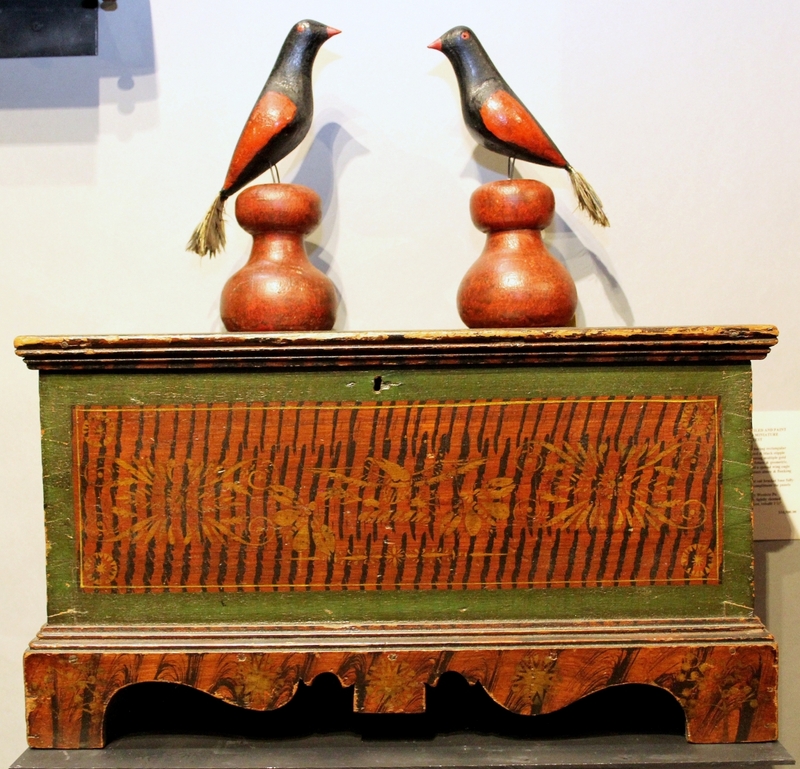 Chalfant offered a Lancaster, Penn., ogee-foot blanket chest inlaid in sulfur with the name Cadarina Moser and the date 1801. 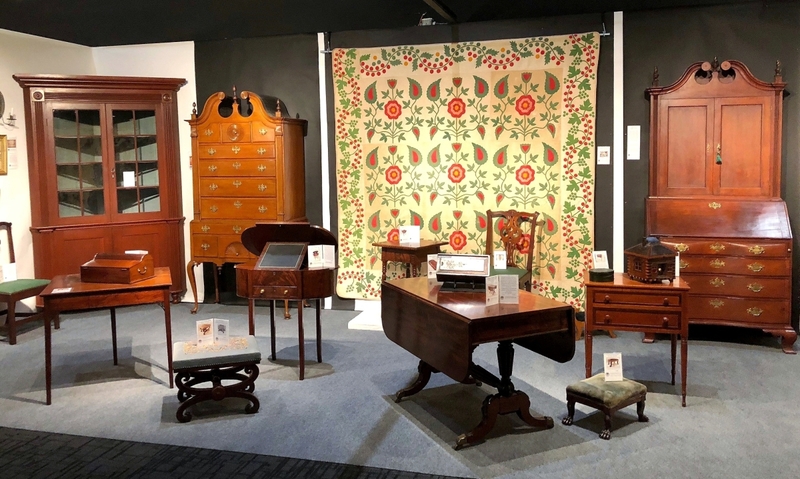 James L. Price paired a paint decorated Lancaster blanket chest of circa 1760 with a Pennsylvania scroll-top high chest of drawers with ornament attributed to the Spiky Leaf carver. 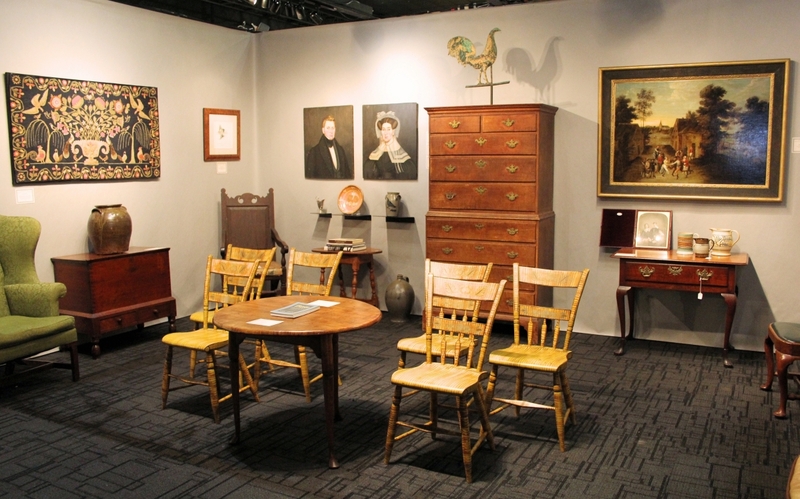 Illustrated in The Windsor Style in America by Charles Santore, a circa 1765-80 Philadelphia Windsor comb-back chair, ex collection of folk art collector Stewart Gregory, was a highlight at James and Nancy Glazer. 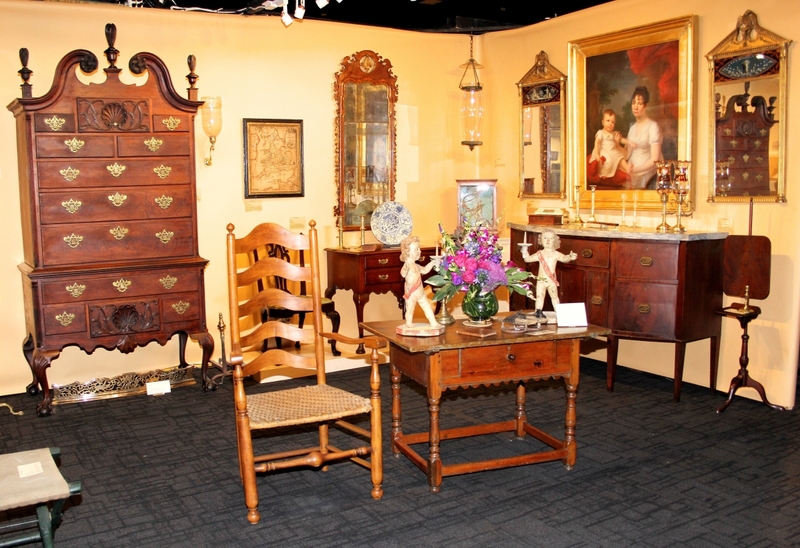 Tiger maple furniture cast a golden glow at Diana H. Bittel Antiques, where a Delaware Valley Queen Anne highboy dated to about 1765. 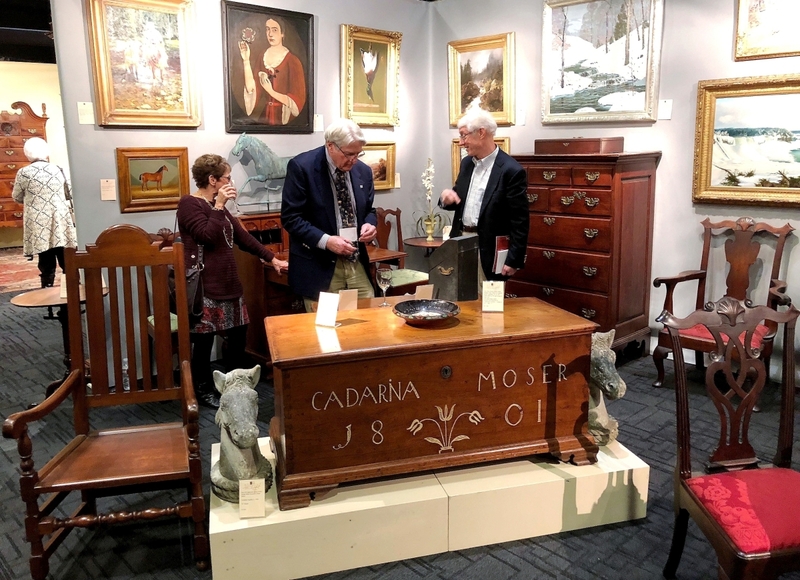 The Bryn Mawr, Penn., dealer accented her booth with a rare Bermuda chest, a specialty for which she is known, and a pair of ironwork gate sections ornamented with sunflowers. There were tall case clocks by the half-dozen. 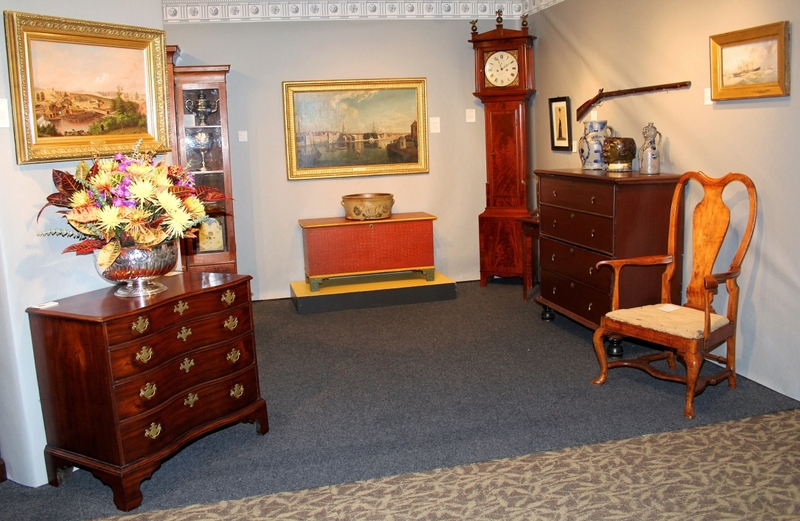 Downingtown, Penn., dealer Philip Bradley featured an eight-day clock by Anthony Ward in a walnut case. 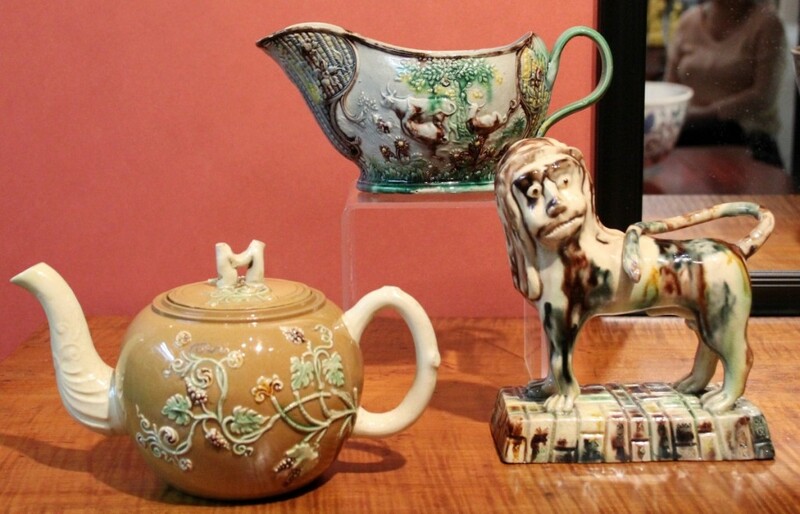 The rare example is one of a handful by the Philadelphia maker, who worked in the city between 1717 and 1725. A second tall case clock at Bradley was by the Montgomery County, Penn., maker Adam Brandt and dated to about 1795. 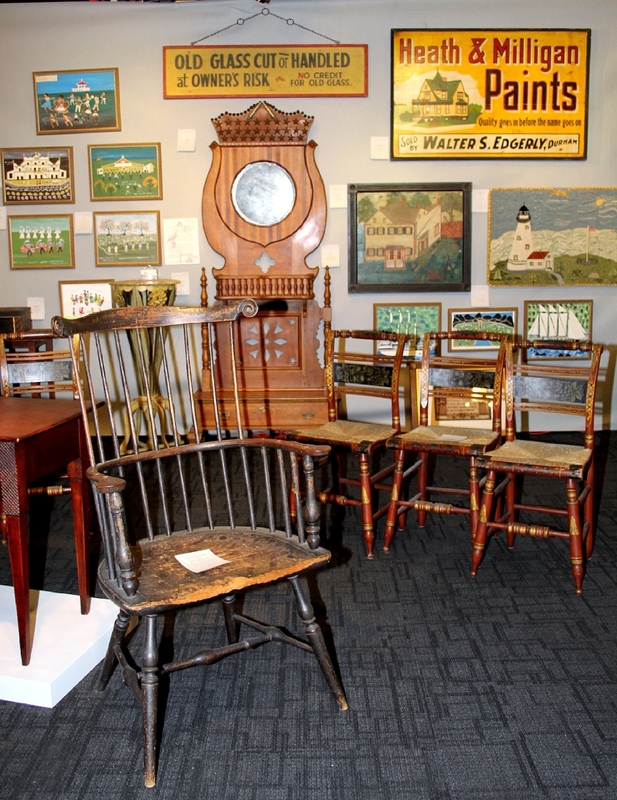 Two booths away, New Oxford, Penn., dealer Kelly Kinzle showed a circa 1770 eight-day tall clock by Hugh Bigham, from what is now Gettysburg, Penn. 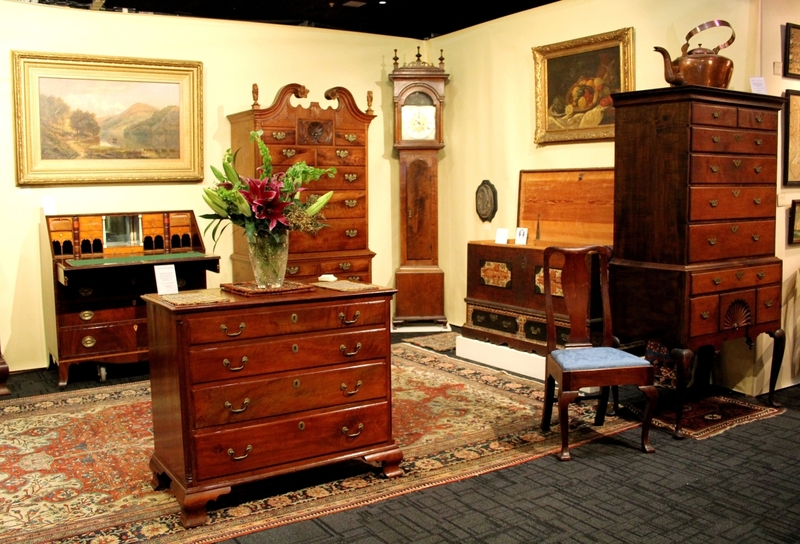 Kinzle noted similarities in the construction of the walnut case to some York County examples, suggesting mobility among makers and their clients. 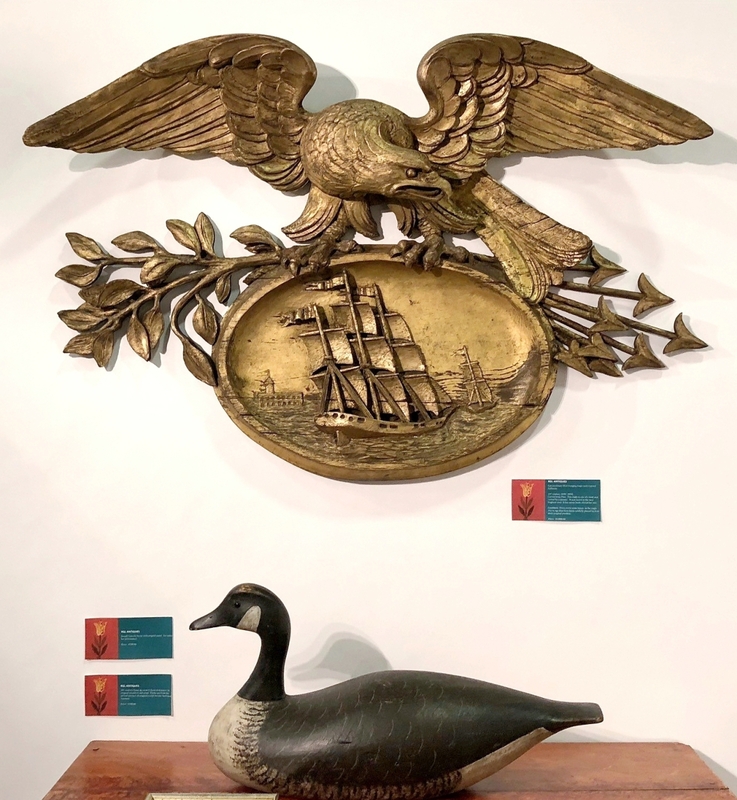 The Delaware Antiques Show has positioned itself as the foremost fair for Southern decorative arts, a stance Winterthur enhanced this year with talks on Southern collecting in the post-Civil War era and on Robert Stewart and the Antebellum Natchez furniture trade. James William Lowery, Baldwinsville, N.Y. 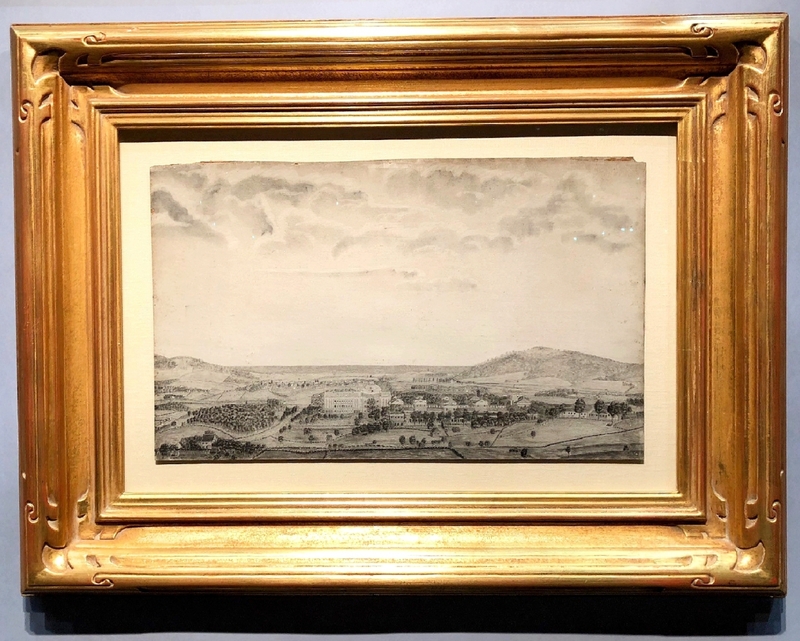 Stepping in for pewter dealers Bette and Melvyn Wolf, Lori Cohen of Arader Galleries in Philadelphia dazzled with the rare “View of Charlottesville, Virginia.” Drawn between 1854 and 1886, the graphite on card stock work includes a glimpse of Jefferson’s home, Monticello. 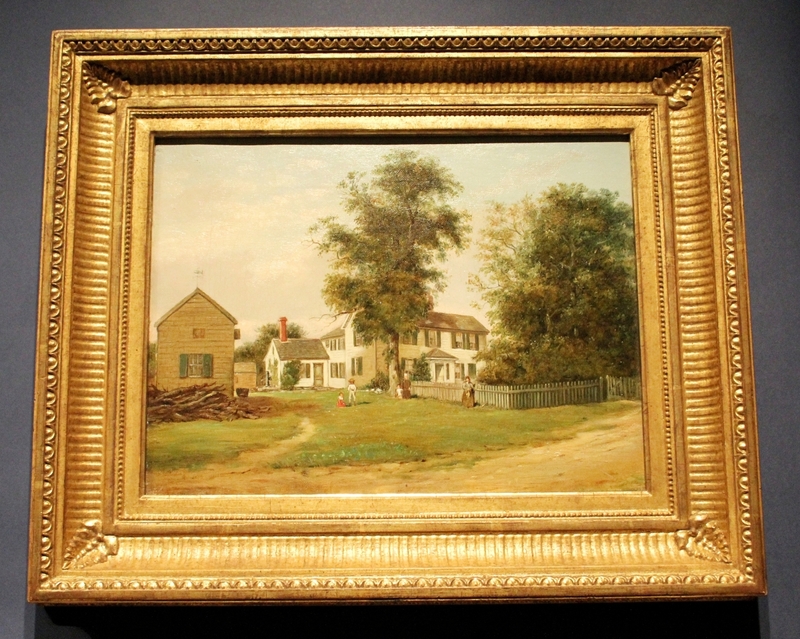 Washington DC’s Kalorama district, depicted as a scenic marsh in “A Pond” by Max Weyl (1837-1914), drew onlookers at Schwarz Gallery of Philadelphia. 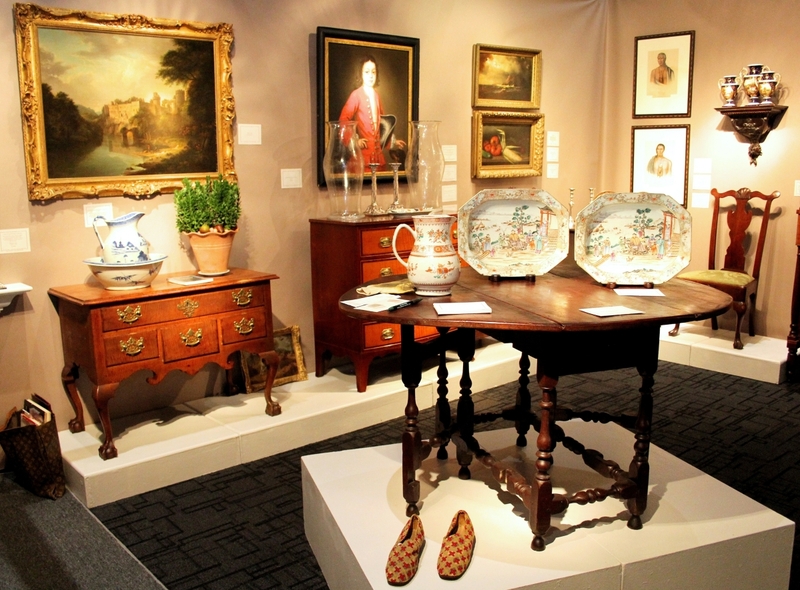 Southern decorative arts specialist Sumpter M. Priddy III featured a round dining table attributed to the circle of Peter Scott of Williamsburg, Va., 1725-50. 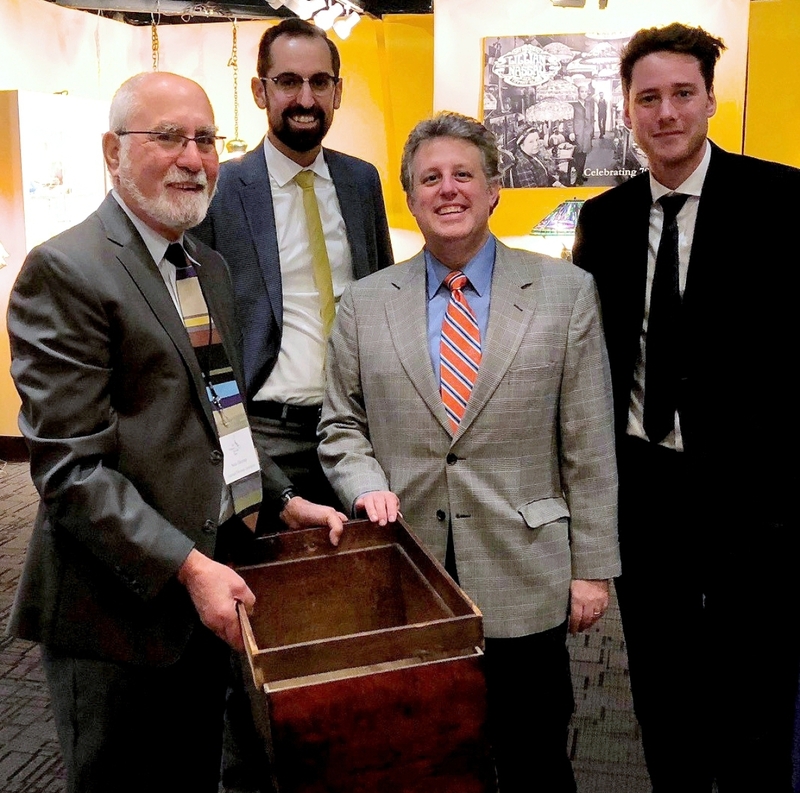 His fellow Virginian, Christopher H. Jones, also from Alexandria, presented a Southern Piedmont of Virginia cellarette and a Shenandoah Valley of Virginia corner cupboard. 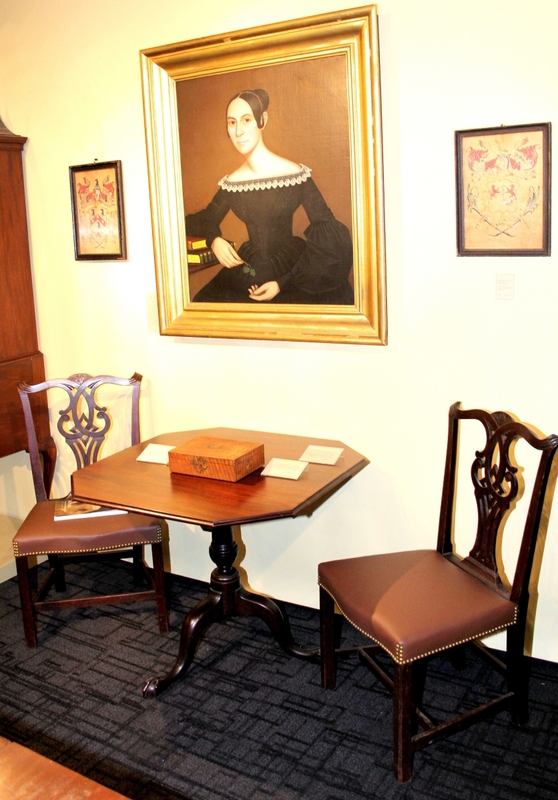 The two leading American needlework specialists boasted impressive depth in Mid-Atlantic and Southern material. 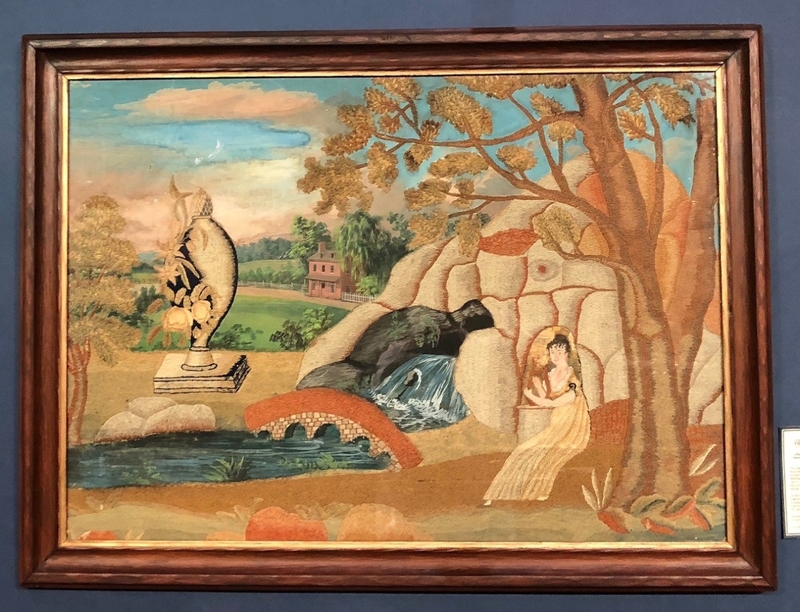 A striking silk embroidered picture from the Lofland and Bruff families of Maryland’s Eastern Shore and Delaware anchored Stephen and Carol Huber’s display. 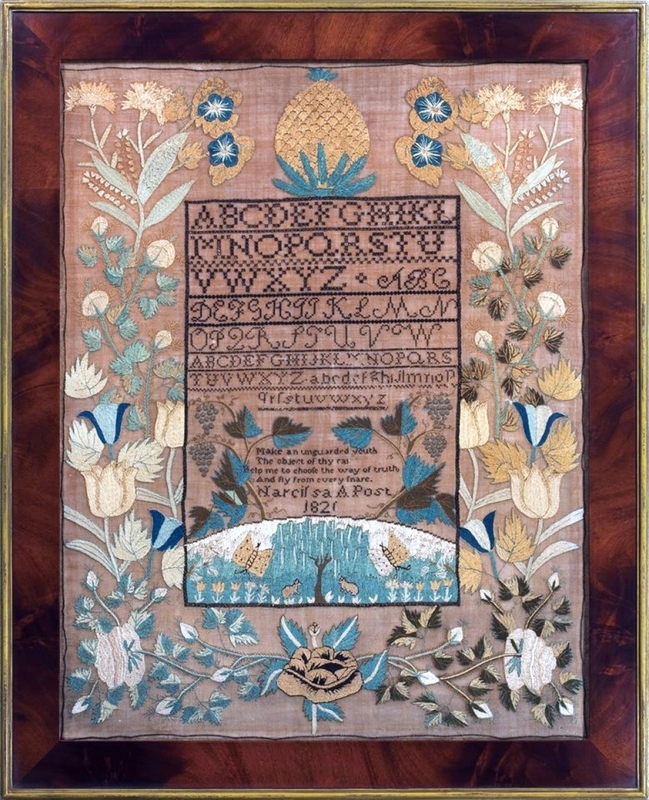 Elsewhere in their stand was a colorful Pennsylvania sampler worked at Mary Ralston’s school in Easton, circa 1830. 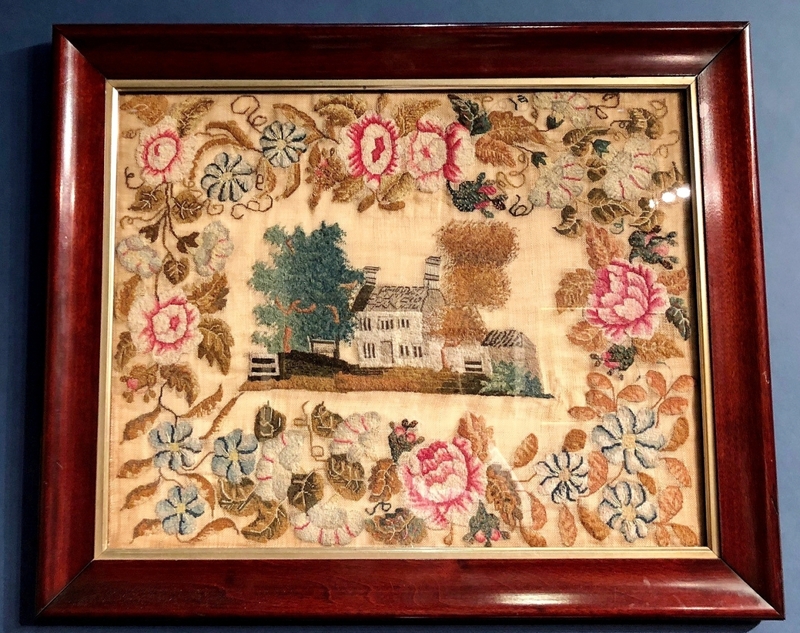 In advance of Gloria Allen’s new book on Delaware girlhood embroidery, M. Finkel & Daughter hung an important 1821 sampler by Narcissa A. Post from the “Fruit & Flowers” group, featuring lush floral borders topped by pineapples and worked at Mrs Cloud’s Young Ladies Seminary. 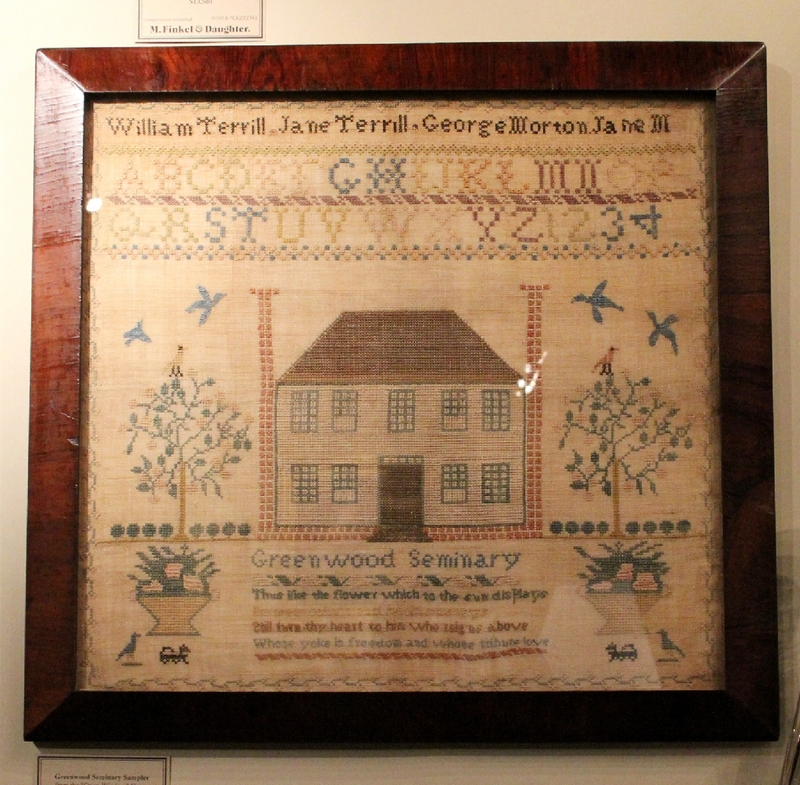 A Greenwood Seminary sampler from the “Open Window” group of Virginia was another of Finkel’s treasures. Elsewhere on the floor, an 1860s Kentucky appliqued quilt turned heads at James William Lowery of Baldwinsville, N.Y. 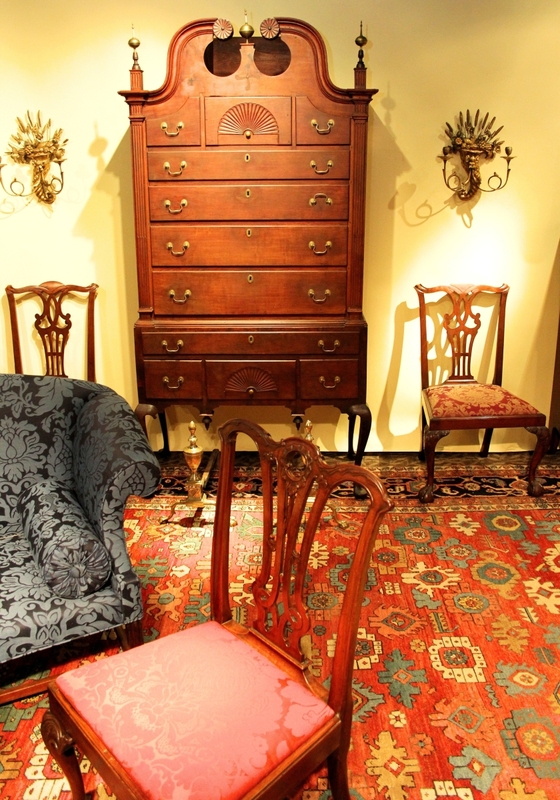 Among the finest pieces of New York and New England furniture? 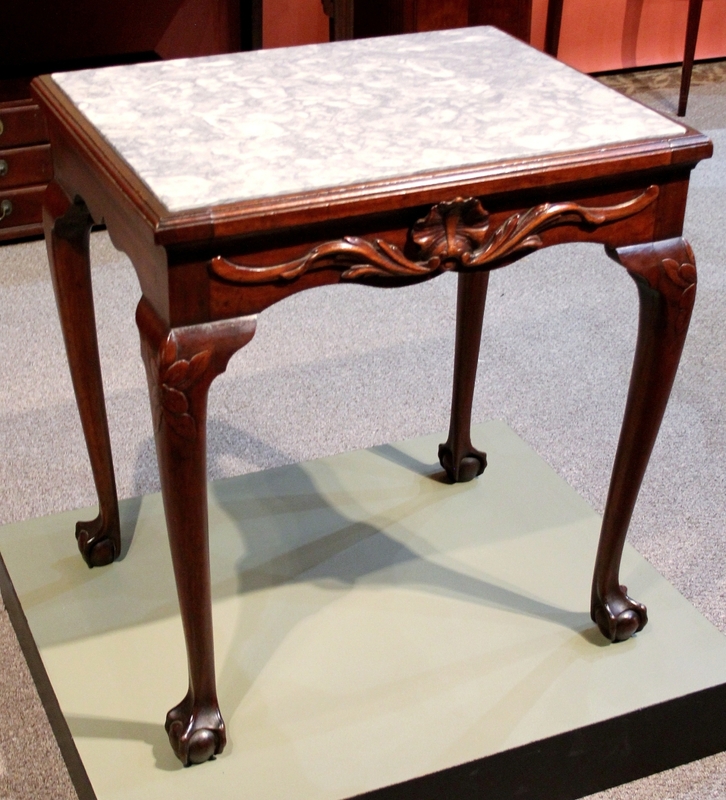 A New York marble-top mixing table of about 1750 at Sumpter Priddy III; a Rhode Island William and Mary gate-leg dining table, ex collection of Martin Wunsch, at James M. Kilvington; and an exceptional Sheraton desk and bookcase, probably from Salem, Mass., circa 1815-20, at Peter H. Eaton Antiques, Newbury, Mass. A gutsy block and turned, paint decorated Nantucket side chair was a keeper at Hilary and Paulette Nolan. 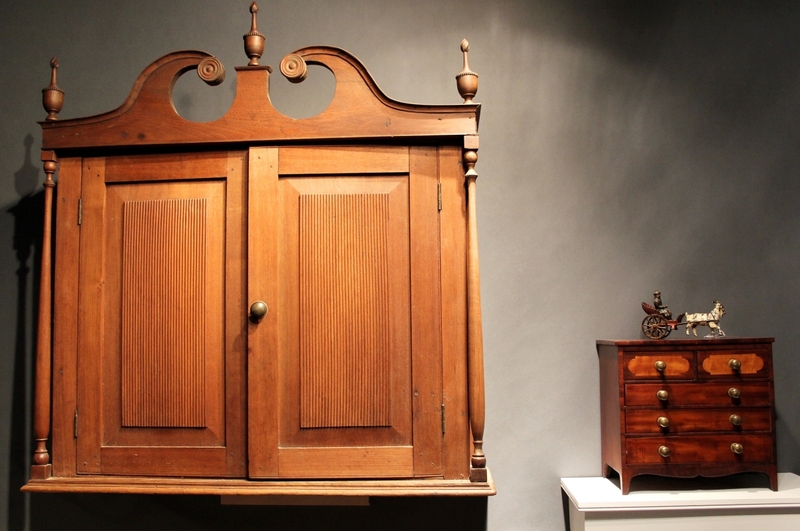 “It’s a Rubens,” Arthur Liverant said of his voluptuous sideboard, in pristine condition and probably made somewhere along the Connecticut River, perhaps in the area of Springfield, Mass., or Windsor, Vt. Above it hung John and James Bard’s signed watercolor portrait of the steamer Cleopatra pulling a barge. 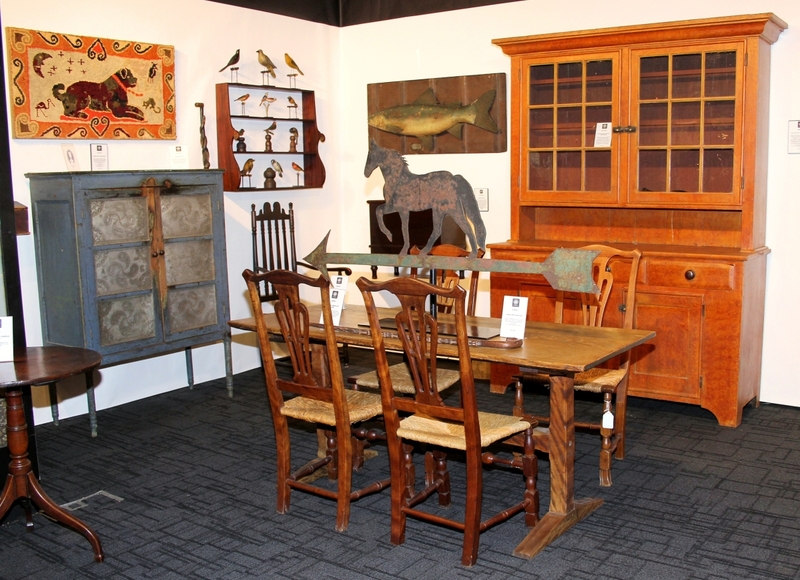 The Colchester, Conn., dealer circled a hutch table with eight fanback Windsor side chairs, each branded “E. Tracy” for Elisha Tracy of Lisbon, Conn., 1795-1805. “We love the sign. 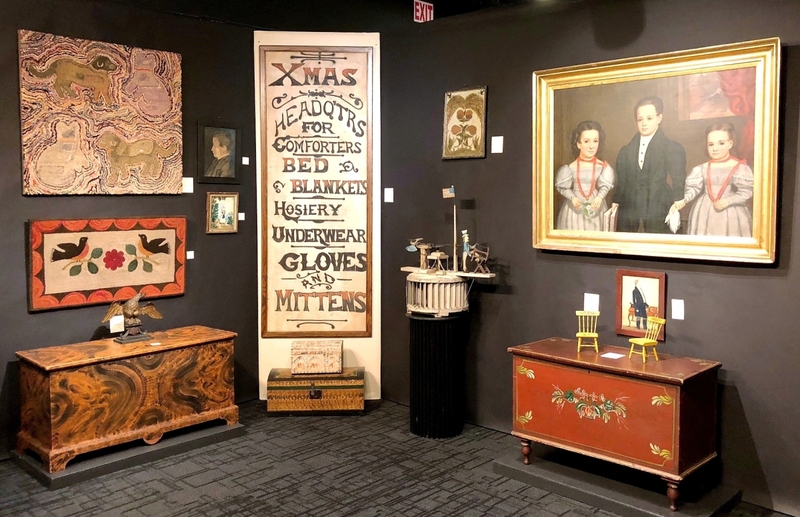 It’s from Carlisle, Penn.,” Tom Jewett of Jewett-Berdan Antiques said of a boisterous advertisement for “Xmas Headqtrs,” an emporium for all manner of cold-weather bedding and clothing. To the sign’s right hung an 1835 triple portrait of three children by William Hillyer. 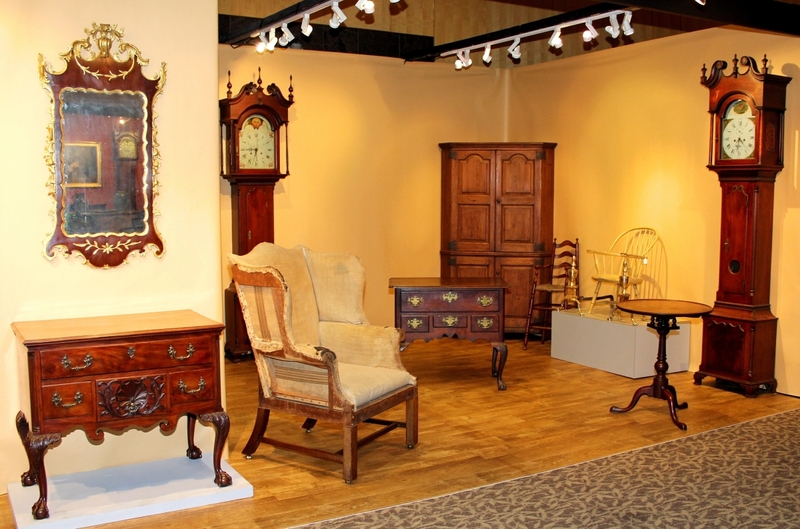 Steven F. Still Antiques, Manheim, Penn. 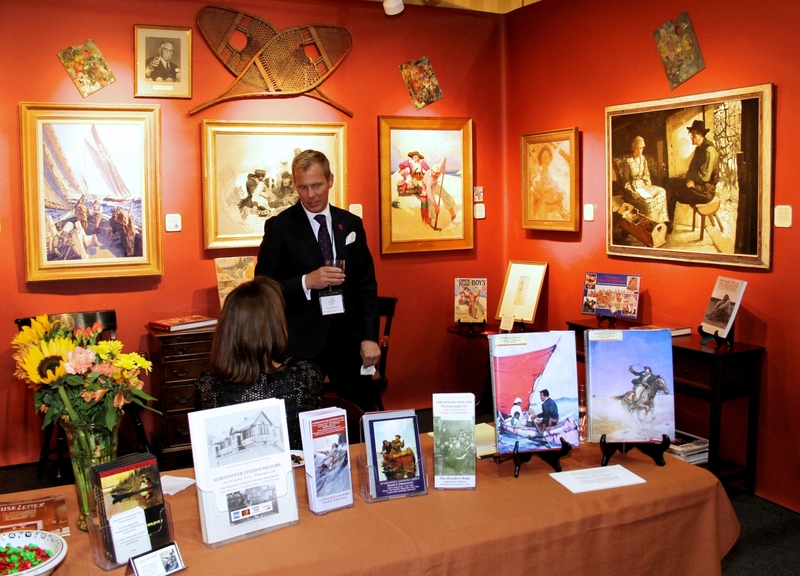 Joan R. Brownstein and Jeffrey Tillou each brought portraits by the Nineteenth Century folk painter by Ammi Phillips. 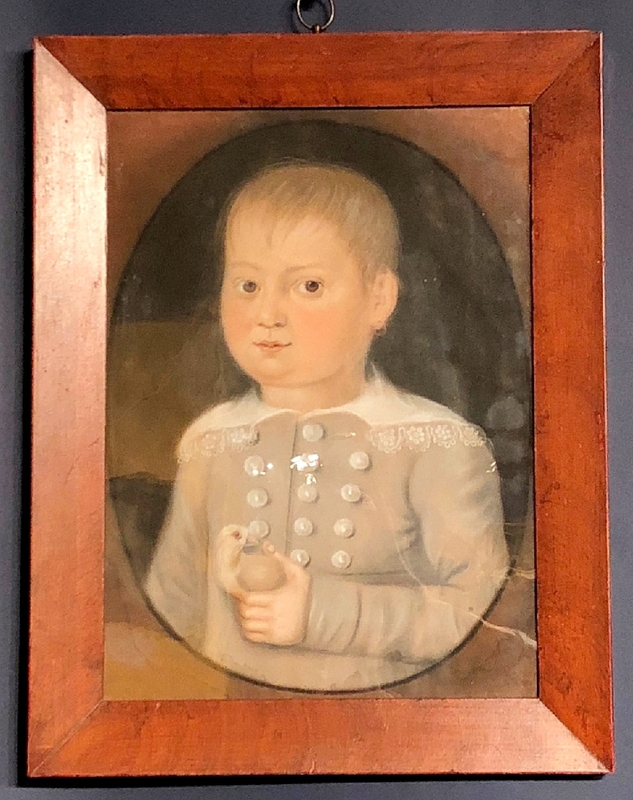 Tillou, from Litchfield, Conn., also showed a pair of primitive oil on panel portraits by William Bonnell (1804-1865), active in New Jersey and Pennsylvania between 1830 and 1835. “This is the third Micah Williams pastel portrait I’ve had recently, all children,” Maryland dealer Bev Norwood told us. 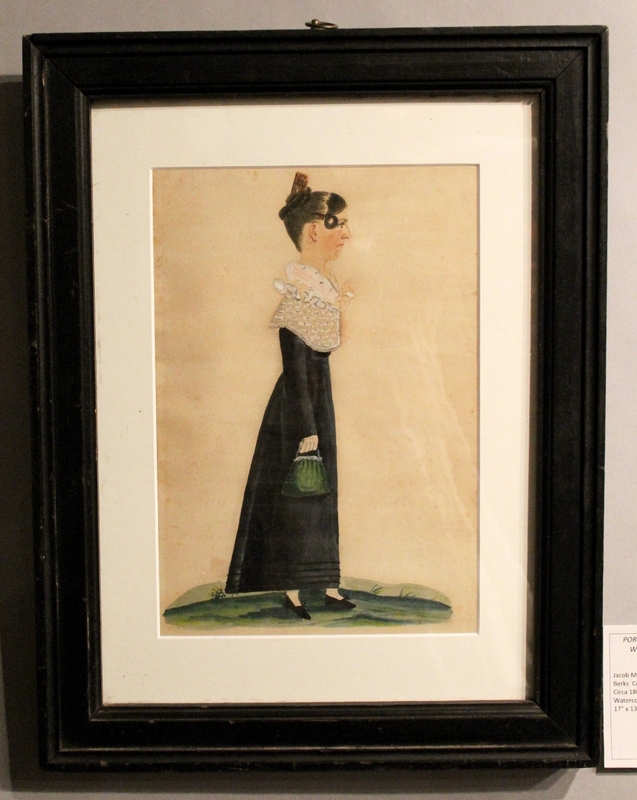 More formal was a trio of oil on canvas portraits attributed to John Hesselius. 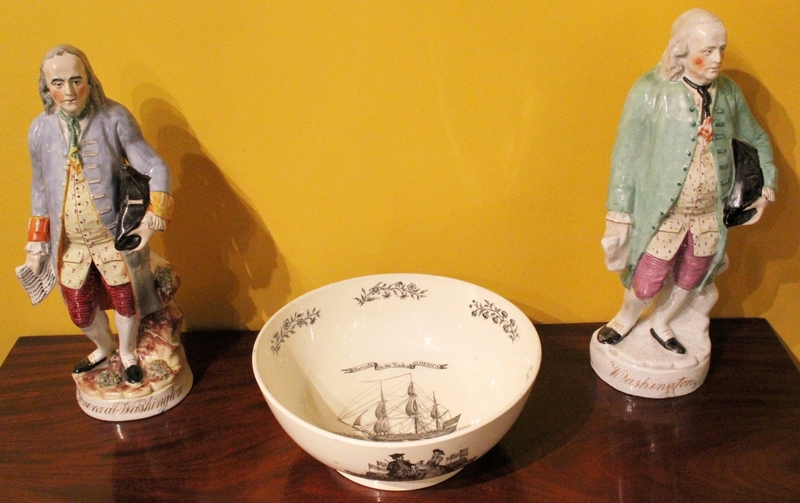 Offered by Christopher T. Rebollo, they depicted George and Sarah Johnston, and their son, George Jr, of Williamsburg, Va., circa 1765. Johnston Sr was a member of Williamsburg’s House of Burgesses; the son, an aide-de-camp to General Washington. 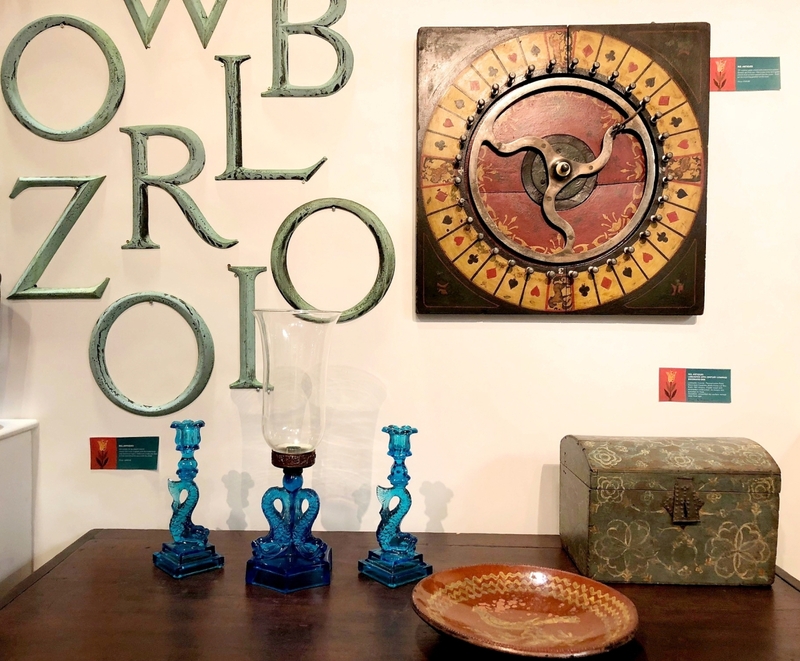 Fine arts paid homage to N.C. Wyeth and the Brandywine school, as well as to artists affiliated with the Pennsylvania Academy of the Fine Arts. 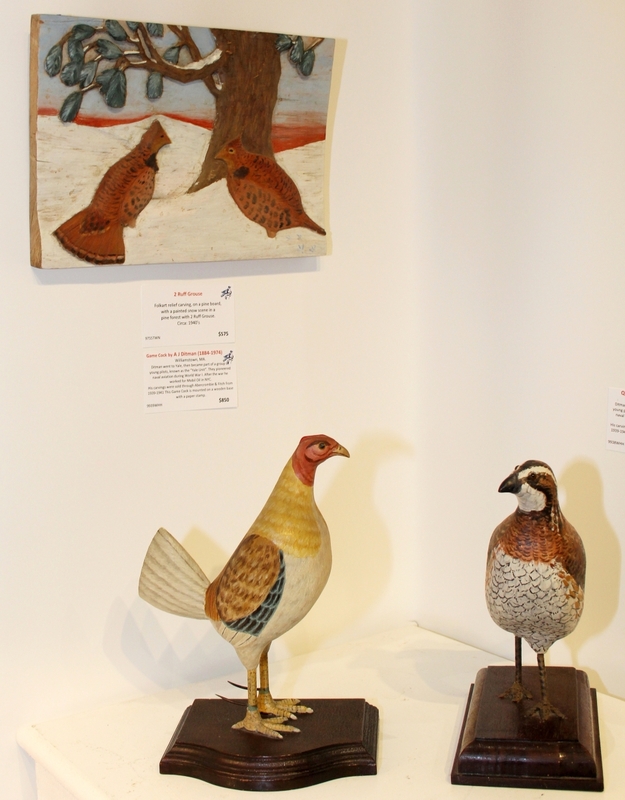 Work by great American illustrators was on tap at Schoonover Studios, Ltd, of Wilmington, Del. At H.L. Chalfant, A.B. 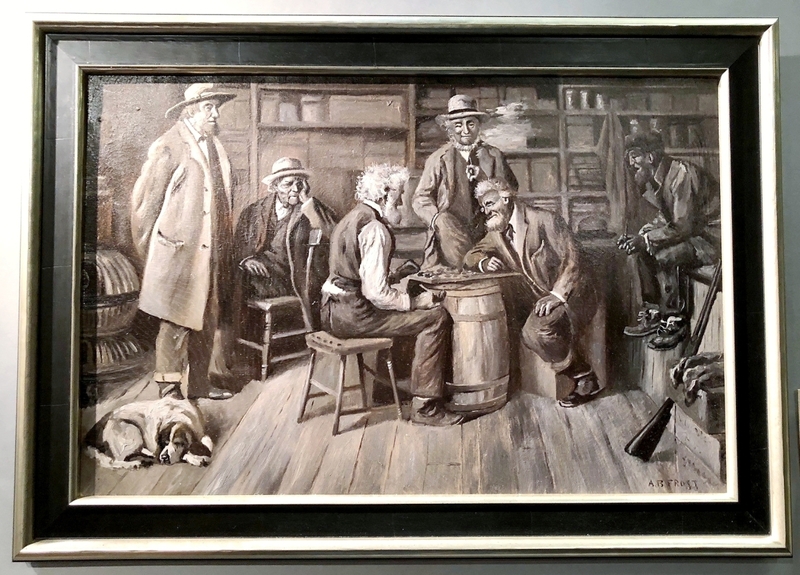 Frost’s signed grisaille painting of men playing checkers dated to about 1902, the year Collier’s magazine published it as a centerfold illustration. The Brandywine tradition continued at Somerville Manning Gallery, where “Blowing Leaves,” a 1980 watercolor by Andrew Wyeth, hung near the circa 1985-86 oil on board “Skep” by Wyeth’s son Jamie. 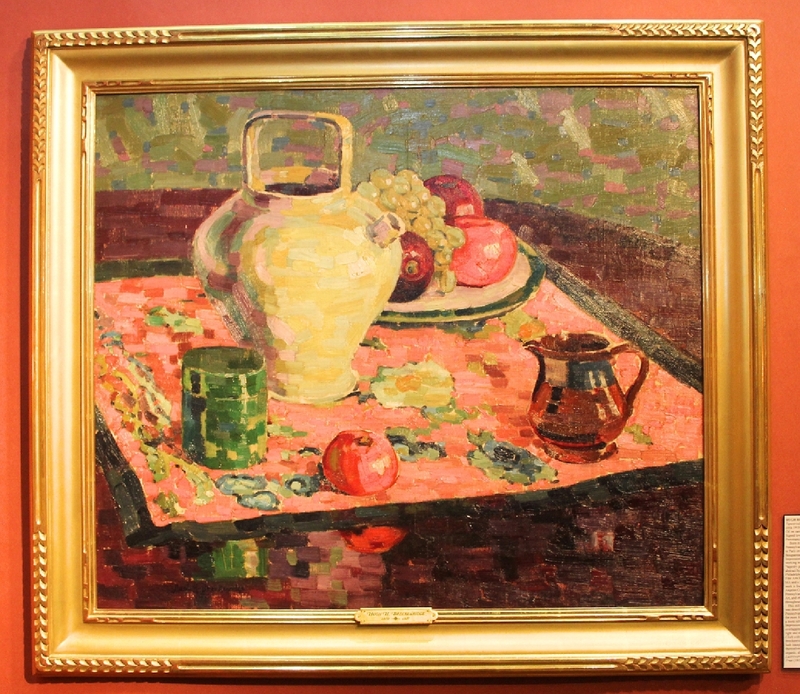 “Tapestried Cloth with Fruit, Lusterware and Pottery” by Pennsylvania Impressionist Hugh H. Breckenridge was a highlight at Dixon-Hall Fine Art. 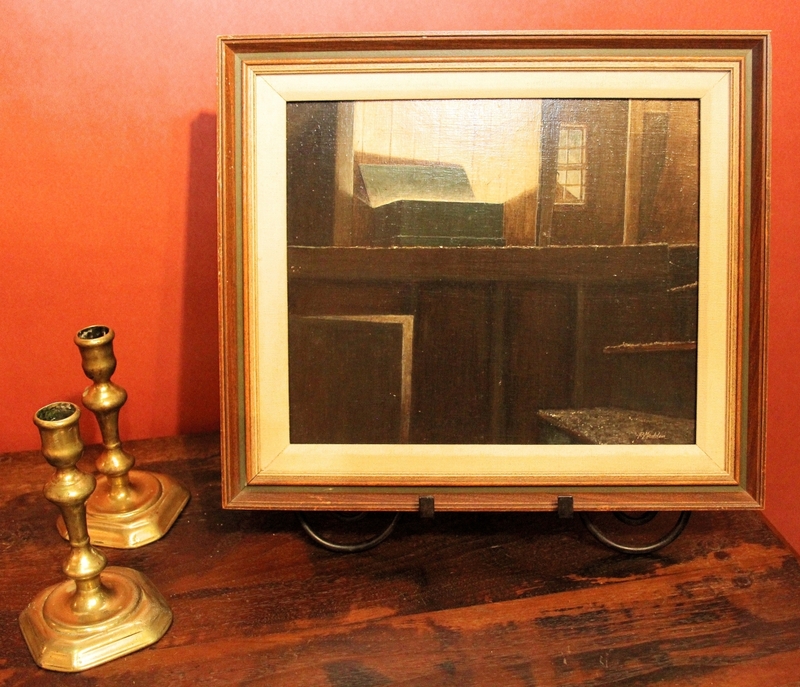 Also of interest was the oil on Masonite painting “The Illuminated Chest” by Paul Madden, a Massachusetts dealer in nautical antiques who died in 2008. 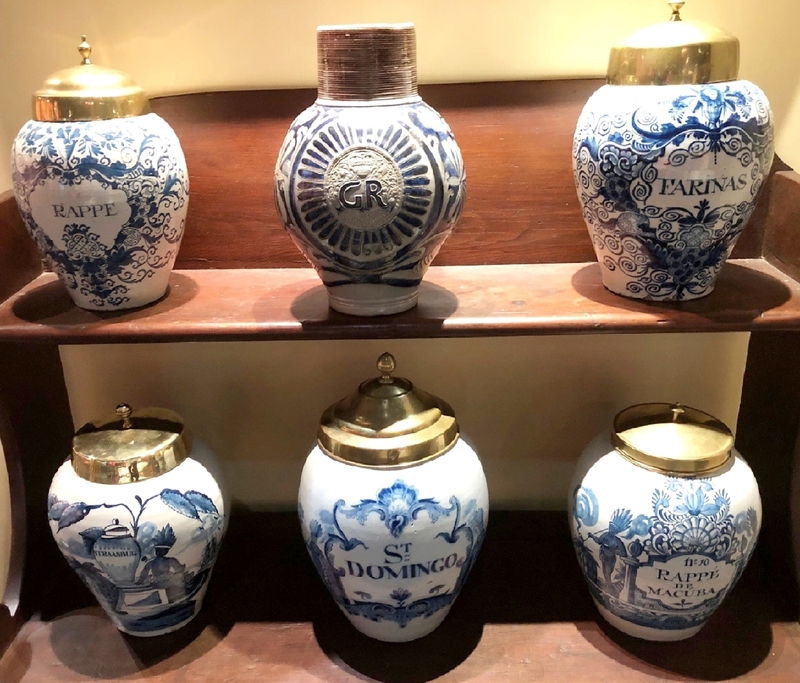 The painting came from the estate of Kristina Barbara Johnson, known for her unsurpassed collection of whaling art and artifacts. 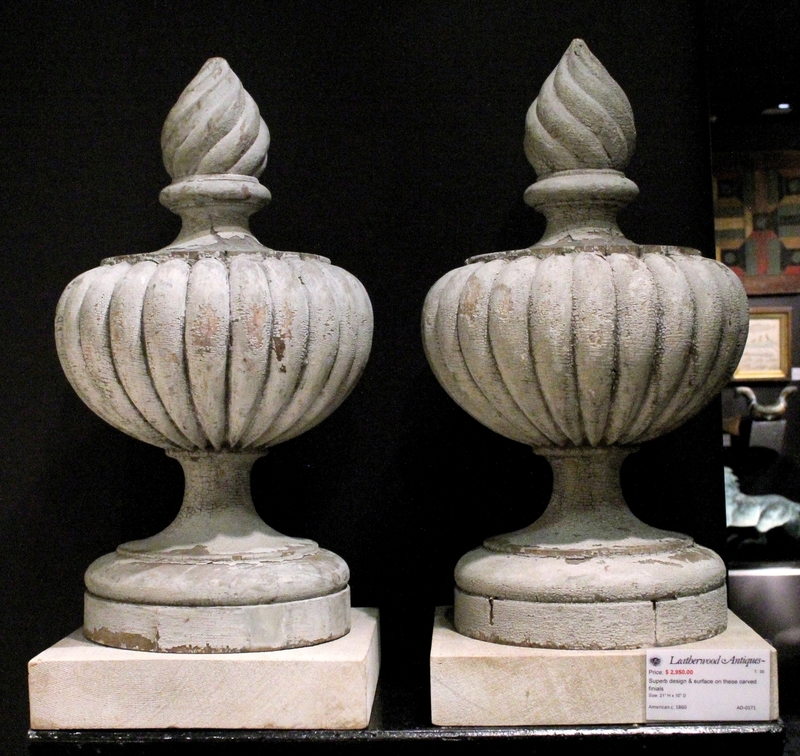 Greg K. Kramer & Co., Robesonia, Penn. 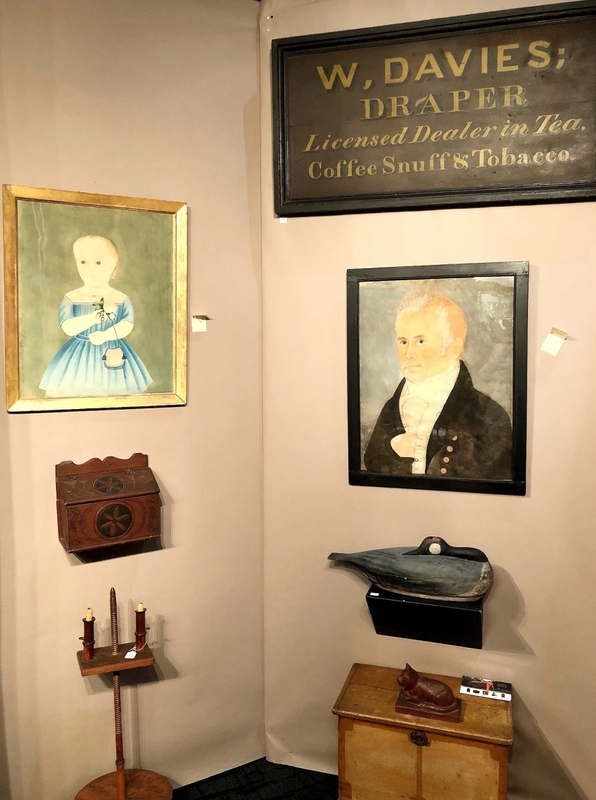 Elle Shushan’s diverse selection of portrait miniatures included at least two, a man and a woman, by the American artist Moses B. Russell, both circa 1845, the man depicting the Reverend David S. Devins of Charlestown, Mass. 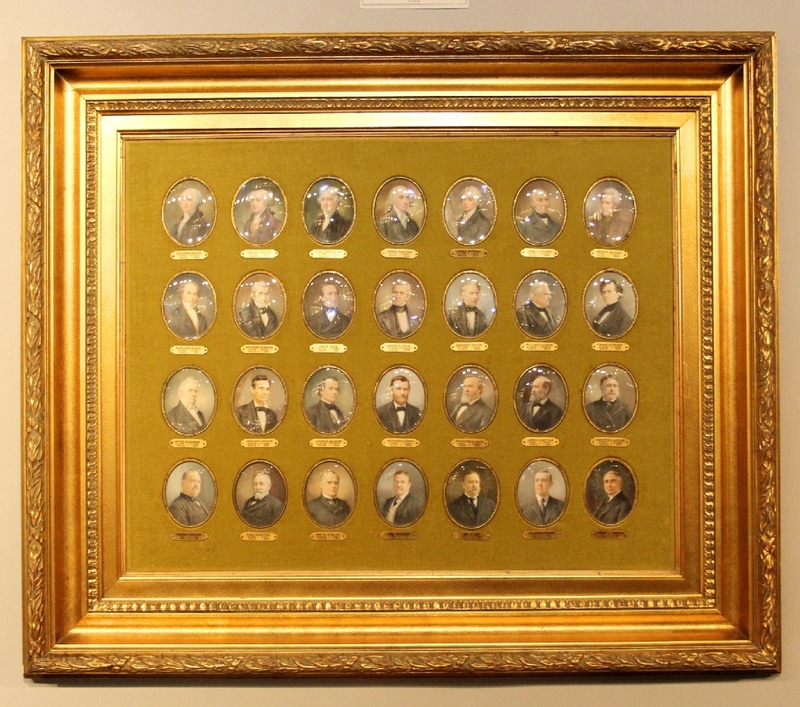 Steven S. Still unveiled a remarkable set of 28 portrait miniatures, framed as one, of American presidents by Illinois artist William A. Patterson. Among them, the portrait of William Harding was signed and dated 1920. As for sculpture, classicism prevailed. 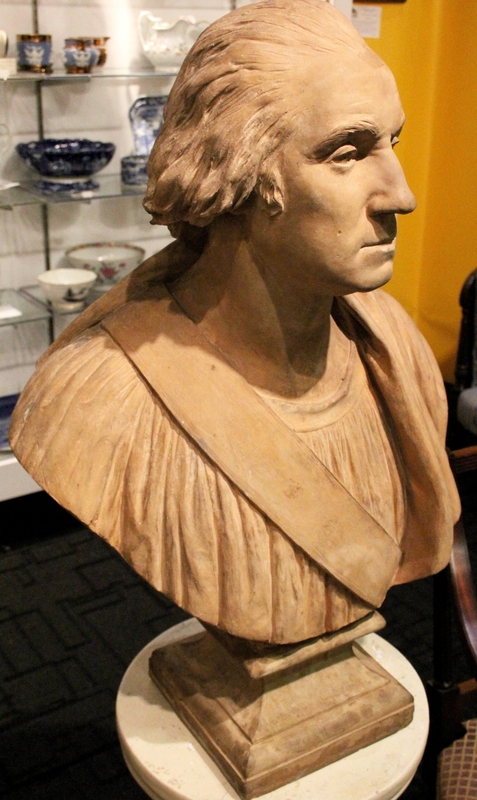 Jesse Goldberg of Artemis Gallery retailed an unmarked terracotta portrait bust of George Washington after Jean Antoine Houdon. 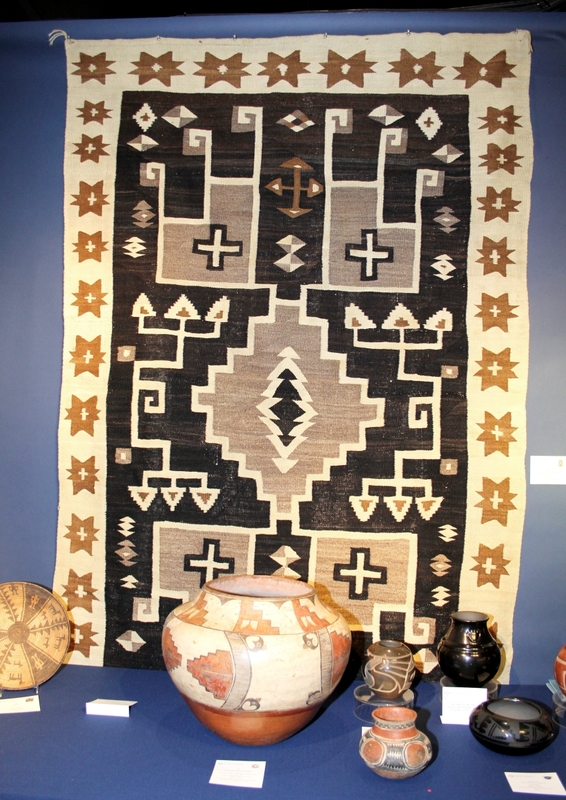 A signed example brought $488,000 at auction in 2008. 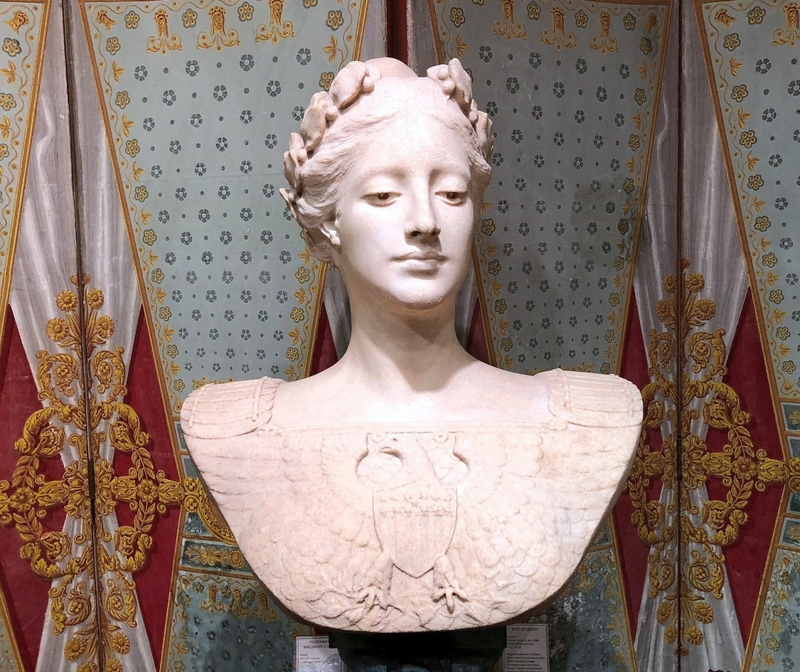 Against a mid-Nineteenth Century French four-panel wallpaper screen, Christopher H. Jones showed an unmarked marble bust of Liberty from about 1890. 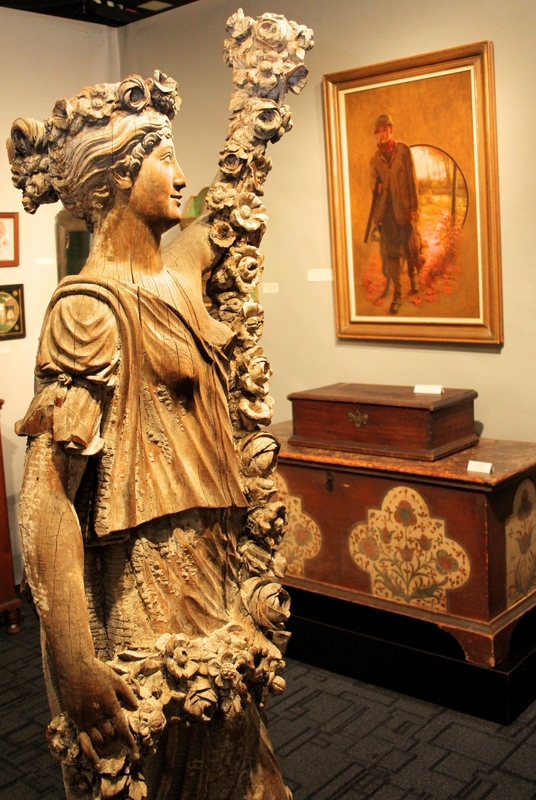 Life-sized and carved in wood, an allegorical representation of one of the Four Seasons turned heads at Steven S. Still, Manheim, Penn. 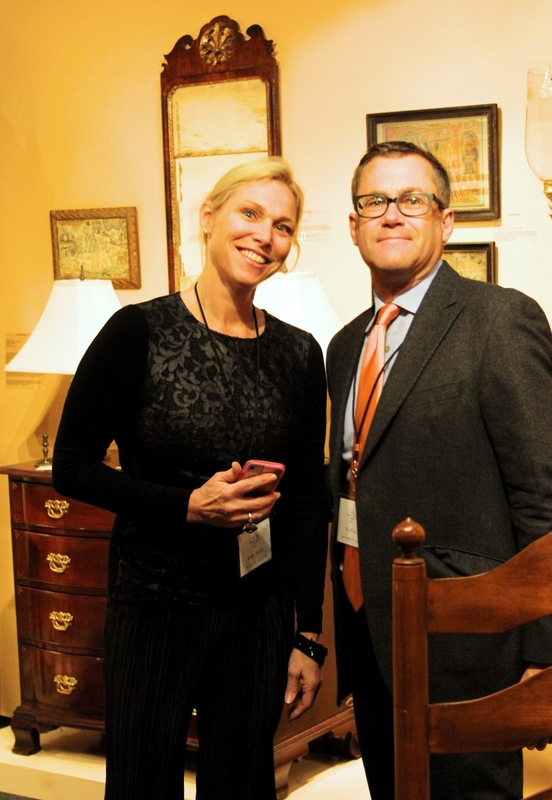 Maria and Peter Warren Antiques, Sandy Hook, Conn.
Against the colorful backdrop of early American glass, a favorite of Winterthur founder H.F. du Pont, RGL Antiques presented a mermaid fountain. 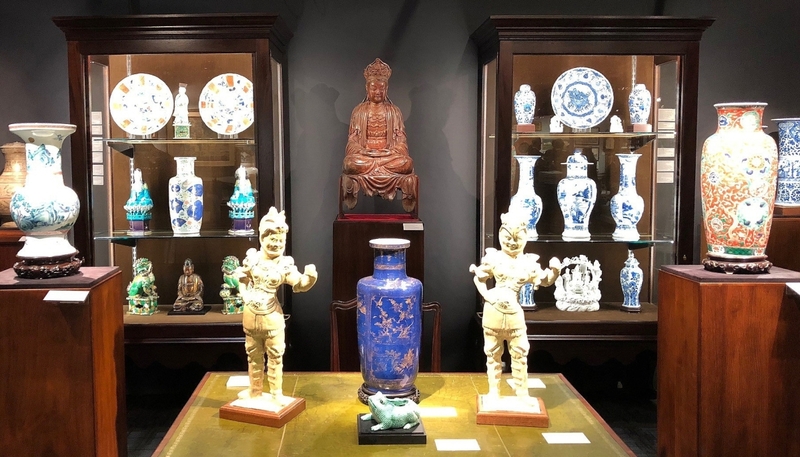 Depicted as children in chinoiserie dress, a set of four Vicenza marble limestone musicians were highlights at garden antiques specialist Barbara Israel. 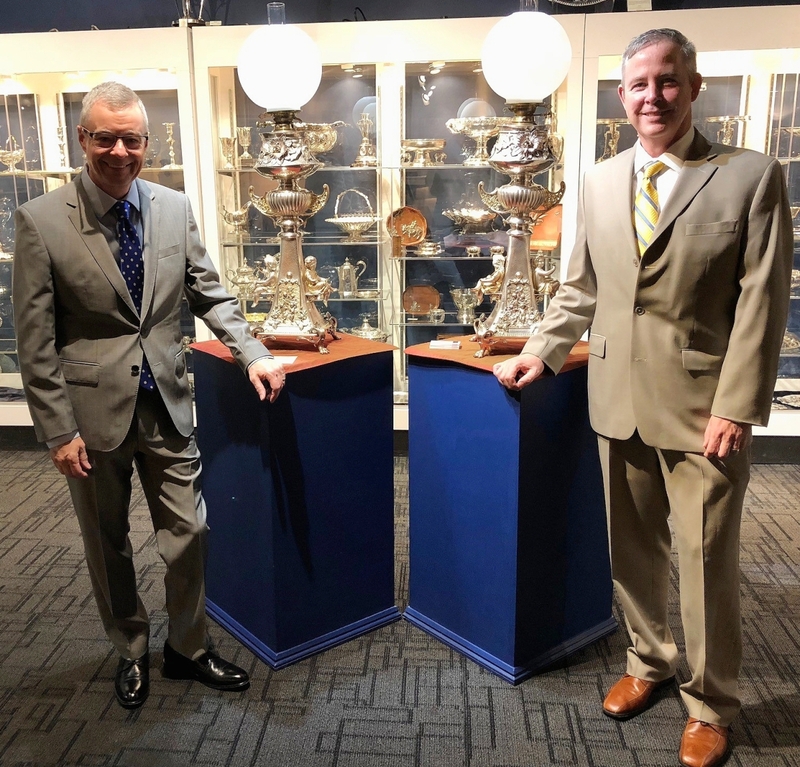 Silver specialists Spencer Gordon and Mark McHugh of Spencer-Marks Ltd intrigued visitors with a pair of silver and gold electroplated banquet lamps by Reed & Barton, Taunton, Mass., circa 1885. 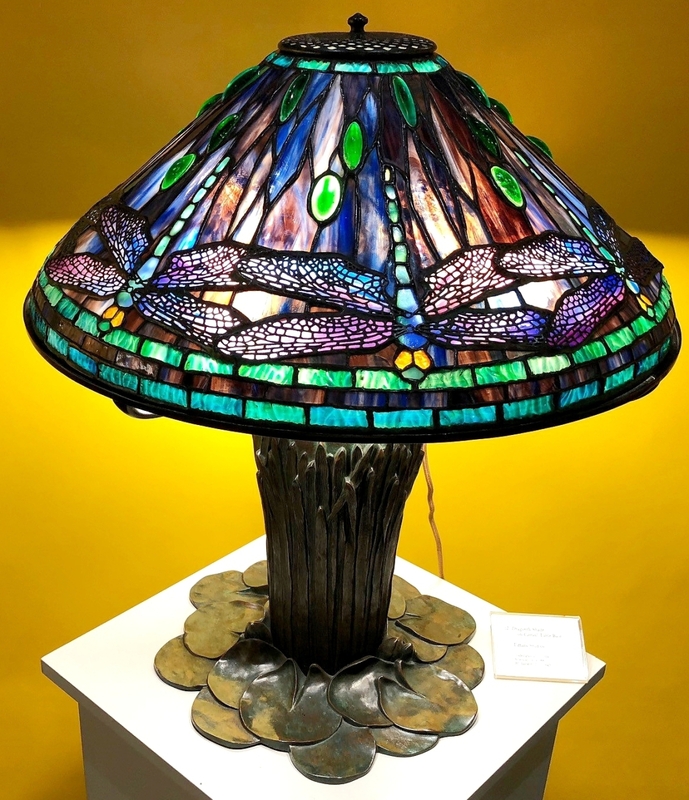 Slightly later in date was the circa 1906 Tiffany Studios table lamp at Lillian Nassau, LLC. It combined a Dragonfly shade with a Cattail base, a rare, much coveted pairing. 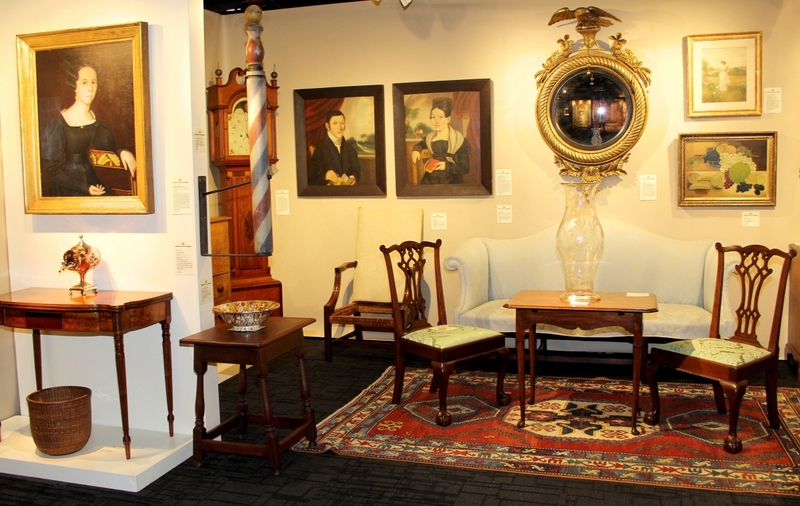 The 2018 Delaware Antiques Show is planned for November 9-11. For information, 800-448-3883 or www.winterthur.org/das. H.L. 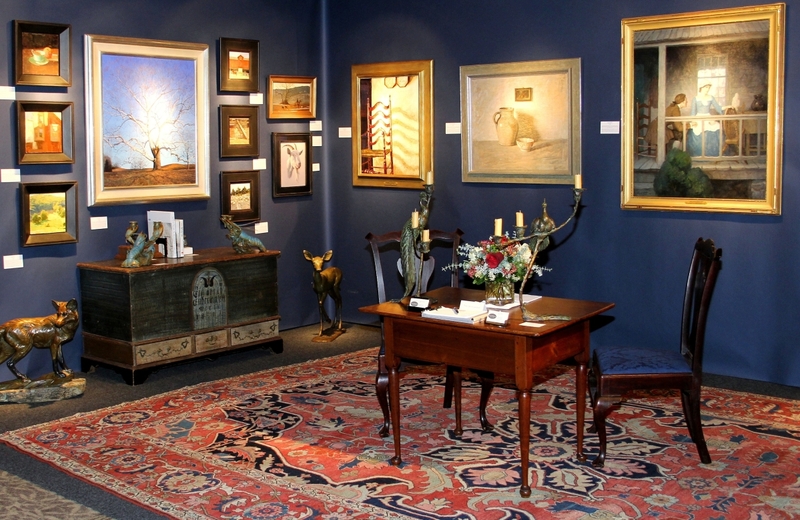 Chalfant Fine Art and Antiques, West Chester, Penn.